As spring creeps around the corner, Japan begins to be coated in a beautifully subtle pink mist, as the cherry blossom, or sakura, paints the country with a pallet of delicate colours. Beginning in Okinawa in the south, the cherry blossom in Japan starts to spread north before reaching Hokkaido in early May. The arrival of the blossom varies depending on the weather, but this time does see the country absorbed in the excitement of the upcoming blossom. Sakura is a traditional symbol of Japanese culture, as seen in the design of kimonos, textile prints, a 100 yen coin and even limited edition food available during the blossom season. 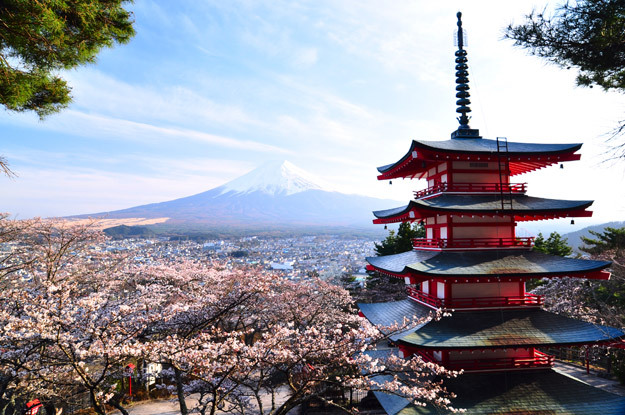 Japan can become bitterly cold in the winter and powerfully hot in summer, so spring has become the most popular time for visitors and the perfect opportunity to take a tour of Japan. Spring is commonly associated with new life. It is considered to restart life and awaken nature after the dark winter months. The cherry blossom represents this notion. The cherry blossom tree is believed to have been native to the Himalayas, but has become one of the most iconic images of Japan. Cherry blossoms symbolize the transience of life which is a major theme in Buddhism and have long held a significance to Japanese nationalism and militarism. Signifying the fragile beauty of nature and life, you can find the first written reference of the cherry blossom in the Kojiki, as it depicts ceremonies and celebrations during the Tang Dynasty. It was first associated with plum blossoms before being exclusively linked with cherry blossoms during the Heian Period (794-1185). Though the cherry blossom is most widely associated with Japan, where you will find the greatest celebrations, you will notice that it has spread into western culture. Back in 1912, the Japanese government presented 3,000 cherry blossom trees to Washington, D.C. as a symbol of friendship. The cherry trees were a show of Japan’s respect to the U.S. president William Taft. The trees have also been given to Brazil, Germany, Turkey and China as gifts of friendship in the years since. Though many of the flowers appear pink, the sakura actually have their own shade of colour. This is known as sakura-iro, which is a traditional Japanese colour. A wide range of colours are used to describe the sakura blossom, ranging from a pale cream white to pink. Sakura and the sakura zensen (‘cherry blossom front’) is described in stages, 11 to be exact. Those who follow the blossom closely will use these 11 stages to identify the changes that sweep through the country, but the official forecast will only adopt seven of them. The stages are as follows: budding, bulging bud, flowering, 10%, 30%, 50% and 70% bloom, full bloom, starting to fall, falling and then officially over. Hanami is the Japanese traditional custom of enjoying the transient beauty of flowers, flowers in this case almost always referring to those of the cherry (sakura) trees. Once exclusive to the imperial court and elites in the country, cherry blossom viewing quickly spread throughout the samurai classes when shogun Tokugawa Yoshimune encouraged people to plant the trees across the country. Hanami soon became a regular source of entertainment. The first references of sakura hanami parties and gatherings can be dated back to the Nara Period (710-794) and has continued to dramatically influence Japanese culture ever since. Food, fashion, art and theatre have all included sakura themes and school children are even taught songs relating to the blossom during the spring time. 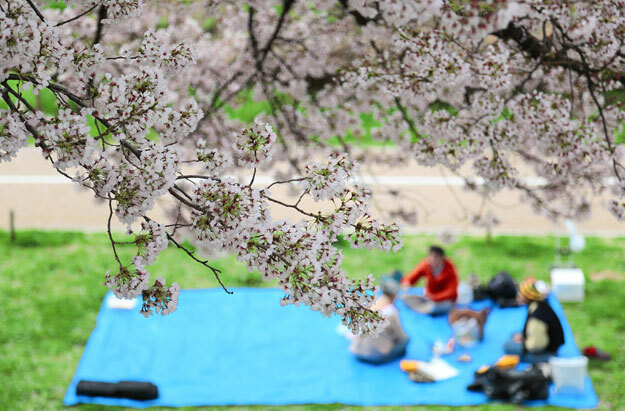 In the present day you will find friends, colleagues and families all gather around parks where they enjoy food and drinks from the vendors and stalls, play games and celebrate beneath the flowering branches of the cherry blossom trees. 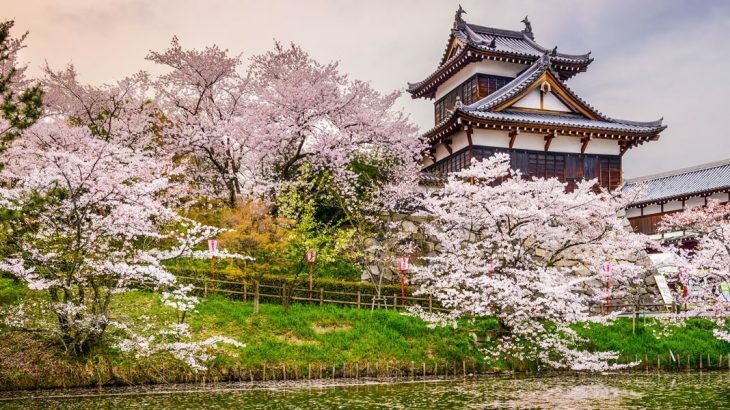 If you are planning to tour Japan on holiday and find yourself around a busy area on your own or in a small group, there is a high chance that you will be invited to parties, gatherings and celebrations during the blossom. The entire country is engaged and enthused by this time of year and will look to make the most of the short time that they have to revel amongst the flowers. 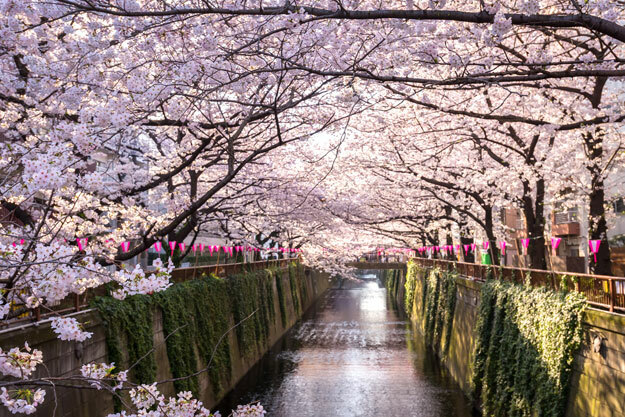 Whether it is a park, gardens, castle grounds, riverbanks or along the streets, you will find a number of hanami spots where people will be celebrating the festival throughout the day. For a spectacular sight, view the cherry blossoms at dawn or dusk at nearby landscape gardens or historical castles, with the sun glowing through the various shades of the pink cherry blossom flowers. During springtime and the sakura season, Japan produces a number of limited edition seasonal specials in food and drink. Hanami and the flowers of the cherry blossom attract and join people together during this time of the year, but there is a Japanese proverb that shows that there is more to it than just the blossom. Hana yori dango means ‘sweets over flowers’ and translates as ‘practicality over aesthetics’. 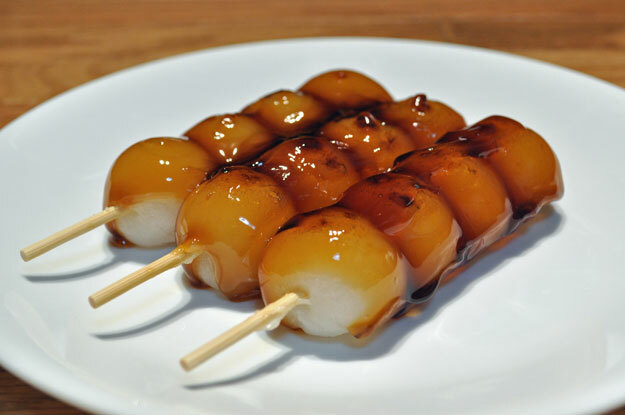 It refers to the focus on the ‘practical’ things that can be created from the flowers like the dango (sweet dumplings), or other food or drink that is created in association with the blossom. If you are fortunate enough to find yourself in Japan during the cherry blossom season you will see large numbers of food and drink stalls pop-up around parks and the streets beneath the cherry trees, ready to cater to everyone during the celebrations. McDonald’s in Japan have even created a sakura themed McFlurry. Mixed into the conventional ice cream is pink waffle coloured by sakura, as well as pickled cherry blossom leaves and a cherry blossom rice cake sauce. The beautiful pink colour of the sakura helps to offer a delicate shade to the foods and drinks, while the flavour itself is a subtle cherry taste which is often mistaken for blackcurrant. Restaurants and shops will have sakura chu-hai (a sweet alcoholic canned drink), sakura crisps, sakura-flavoured Starbucks and sakura dumplings. KitKats and Pepsi also have their own sakura flavours all readily available for anyone wanting to try something a little different during their holiday in Japan. Japan culture, festivals, japan news, nature, photography. permalink.